Since these businesses are expected to add value in a very specific way, we can disaggregate our central mission, which is to become one of the top IT services companies in the world by the year 2010, in a way relevant to each business. We call our mission our “North Star," and each full life cycle business has its own North Star that relates directly to our overall mission. For instance, about 30% of our IT services revenue comes from the banking, financial services, and insurance industries. So we look at what we have to do within these industries that is consistent with our mission. Then at the next level we have to determine what has to happen with customer relationships, what has to happen with our service offerings to the industry, whether we need to form alliances to bring in outside expertise. As part of our effort to minimize risks in these industries, for example, we could set a North Star that says “x"% of our business in the sector must come from Europe. This keeps each business moving in the same direction and also prevents them from evolving into individual fiefdoms that may have conflicting priorities. Along with defining what needs to be done, these separate North Stars also guide us in setting individual metrics, which are then used to drive and measure performance. For example, if the goal is to improve profitability on an ERP2 project, metrics for individual full life cycle businesses on the team could include increasing the percentage of team members with ERP certification from, say, 60% to 90% or increasing first-time-right numbers for ERP support from 96% to 99.9%. We consider ourselves in the business of building leaders. The most effective way of realizing our goals and objectives is to grow leaders faster than the competition. Taking a non-India-centric view in attracting leaders from all over the globe and growing existing leaders through focused leadership-development programmes is paramount to our success. The Satyam School of Leadership is dedicated to this effort. Our operational model naturally lends itself to creating leadership opportunities within the organization. In our distributed leadership model, we have ample opportunities for individuals to develop and showcase their leadership skills. Finding and assigning leaders to each of these businesses was initially a challenge, especially when you realize that we need a 25% buffer at any time to accommodate growth and attrition. Also, in 2005 we created an analytical engine called the Real Time Leadership Centre, which works with individual business leaders to identify goals and the metrics needed to track progress towards these goals. The centre also works with leaders to develop the knowledge and skills needed for success—for instance, by training them in management tools and sharing best practices that have worked elsewhere in the organization. And it also tracks the metrics, offering business leaders a dashboard to monitor how they are progressing. Essentially, it makes the language of metrics our first language. Satyam has indeed developed a language of its own around this model—North Stars, full life cycle businesses, and other terms we haven’t even mentioned. Why is this necessary? When we were a small company, associates could talk to each other on a daily basis. Our beliefs were extensively discussed. Course correction was dynamic. Today we have grown to an enormous size, and growth continues to be staggering. Each day I meet more associates who are new to me than associates I already know. In this environment cultural integrity and consistent solution delivery are possible only if we have a reliable platform and a common language. Constant refinement of the SatyamWay and relentless dissemination of its principles has to be a focused effort. If our most recently recruited class of associates—not the ones who have been with us for years—can articulate our philosophy, we have succeeded in our effort. Also, one of the biggest challenges you face when trying to change an organization is instilling a belief slightly before it becomes a credible reality. That “slightly before" is not huge, but every change process has to go through a hockey stick: you dip in belief substantially before the process starts to become credible within the organization. You have to be reminded about it enough times through a common language so that when it comes back to becoming credible within the organization, it takes on a new meaning. Whether it is “deep dives" in consulting language or “How are your 6 Ps doing?" in Satyam terminology, it gives you a sense of how your businesses are managed. Did the effort initially meet with a certain amount of cynicism? Rather than cynicism, I would refer to the doubts in the initial years as apprehension. As the company attained a certain size, almost everyone recognized the desirability of the new business model, although the pace of adaptation was very different through the organization. But for change management of this magnitude to succeed, you have to be consistent. You must keep asking the right questions until enough parts of the organization actually show results. You must share success stories and adopt best practices within the company. In a book we give employees detailing the SatyamWay, it discusses one client case where we’ve been working with the model for the past decade. It’s gone from being one of our most complex accounts to being one of our most profitable accounts. This change has freed up time for managers to do strategic thinking rather than fight fires. Influencing and connecting with the ecosystem better and enhancing the leadership development effort have yielded gratifying results. When such examples become a reality in the rest of the organization, the language starts to take on a new meaning. But if you try to deal with the initial apprehension through authoritative approaches, it’s not going to work. So you just let it ride. You keep asking the same questions, repeating the same terminology, and being consistent until enough parts of the organization realize the value and start to follow. What’s the future of the SatyamWay? It goes without saying that this is a continuous journey. The SatyamWay is not a static model but a dynamic one. It requires ongoing course correction. Over the past 20 years we had to reinvent ourselves half a dozen times. Each phase of the evolution was dramatically different, but at the same time enduring. As we experienced these changes, the SatyamWay guided the organization in transitioning from one phase to another without rocking the boat off balance. As much as it has been an influencer of change, the SatyamWay was also influenced by the changes in the organization and the market place. I see no reason to expect this to change as we embark upon our next stage of growth. Born: 16 September 1955, in Jalli Kakinada, Andhra Pradesh, India. Married with two children. Education: Graduated with a BCom (bachelor’s degree in commerce) in 1975 from Andhra Loyola College, Vijayawada, Andhra Pradesh. Received an MBA in 1976 from Ohio University, Athens, Ohio. Attended owner/president management programme at Harvard Business School (1991–93). 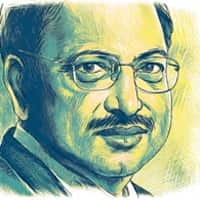 Career highlights: Founder and chairman of Satyam Computer Services (1987–present). Fast facts: Member of executive council of the National Association of Software and Service Companies and served as its chairman (2006–07); national executive councils of the Confederation of Indian Industry and Federation of Indian Chambers of Commerce and Industry. Serves on a number of boards including regional advisory board of Harvard Business School, as well as the board of Indian School of Business and Administrative Staff College of India. Chairman of Byrraju Foundation and Emergency Management & Research Institute—social-equality organizations for the underprivileged in India. Voting member of The Conference Board, and member of international advisory panel of Malaysia’s Multimedia Super-Corridor. Prashant Gandhi is a principal in McKinsey’s Delhi office, and Joydeep Sengupta is a director in the Mumbai office. This article was published as a Web Exclusive in September 2007 and can be found on The McKinsey Quarterly website, www.mckinseyquarterly.com. Copyright © 2007 McKinsey & Company. All rights reserved. Reprinted by permission." Write to us at feedback@livemint.com.